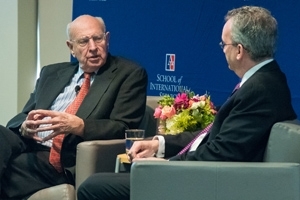 Ambassador Thomas Pickering returned to the School of International Service (SIS) on Wednesday, April 13, to discuss “Envisioning the Future of the United Nations.” This was the final event in a three-part series of foreign policy conversations featuring the ambassador. Throughout the discussion, Ambassador Pickering stressed the importance of the UN and the role of the United States within the system. “For my money, whatever it is we [the United States] pay for the UN and to the specialized agencies, it’s an investment and we’ll take it. Because we, as a great trading power and a great world leader, we benefit as much from the harmony and the organization and the structure and the good work as anybody else does,” said Pickering. But, he also acknowledged that the UN cannot take on the responsibilities of its member states. Also attracting public attention is the UN’s upcoming election for its next UN Secretary-General, noted for being a more transparent process than in the past. Who does Ambassador Pickering think would succeed Ban Ki-moon? “I expect it will be a woman and should be,” Pickering declared. “I also think that the selection of a strong woman would make it harder for states to push her around. Women in some ways do bring different approaches and answers to problems, and it’s time to take another look. We haven’t done so well with men over the years, with rare exceptions,” he said, smiling. Some commentators also speculate that the next UN Secretary-General will come from the Eastern European Group, since that region has never produced a Secretary-General. However, the ambassador dismissed that assumption. A question and answer question session followed, allowing students the opportunity to ask the ambassador questions about peacekeeping forces, the rise of non-state actors, and other critical issues worldwide. When Ambassador Pickering last visited SIS on March 25, he discussed the critical challenges facing the United States’ foreign policy in the Middle East. Pickering examined ways to manage relations with an increasingly assertive Russia amid economic and political strife during the first visit of his series on March 1. Pickering holds the personal rank of Career Ambassador, the highest in the United States Foreign Service. In a diplomatic career spanning five decades, Pickering was U.S. ambassador to the Russian Federation, India, Israel, El Salvador, Nigeria, and the Hashemite Kingdom of Jordan. From 1989 to 1992, he was Ambassador and Representative to the United Nations in New York.